What is a Bookseller Rating & how is it calculated? Bookseller Ratings are based on your completion rate only which is defined as orders that have been completed without cancellation or return/refund. The Completion Rate Percentage is shown as a percentage. So, for example if you had a total of 75 orders, cancelled three of them and had two returns, your completion rate would be 93%. The completion rate percentages are translated into a 5-star rating system. The star rating shown on the search results is based on a bookseller's 6 month completion rate. 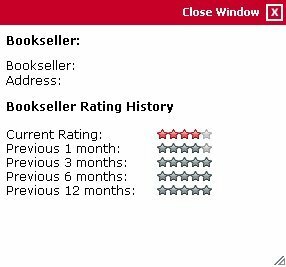 A more detailed Ratings History for the bookseller (previous 1, 3, 6 and 12 month ratings.) is available through the Book Details page. 1. From the search results click on the title of the book you are interested in. 2. Click on the "Bookseller & Payment Information" tab. 3. Click on the "Ratings History" link. 4. A small window pops up displaying the ratings history for the previous 1, 3, 6 and 12 months. The star ratings for each time period are updated at the beginning and middle of every month to show the most recent order history. For new booksellers a default 4 star rating is granted until your first 4 orders are processed. Once four or more orders have been established, the star rating will then be based on the calculated completion rate as detailed above. * Extra charges rejected: Once the buyer has rejected the order you will have the opportunity to process the order. We understand if you wish not to ship the book with a loss of postage in which case you can reject the order. Any orders that are rejected after the buyer rejects the extra charges request will not count against your Bookseller Rating. Note: Please do not let orders expire, even if the buyer has rejected the shipping these will count against your Bookseller Rating. If you have an order that you feel should not be included as part of your Bookseller Rating, you have the ability to exclude it from the calculation. Up to 3 orders within a 12 month time period may be excluded by you. In June 2014, we made some changes to the AbeBooks Completion Rate requirement and Bookseller Ratings. In June 2014, the minimum Completion Rate requirement for AbeBooks sellers was raised from 85% to 90%. We have implemented these changes because we believe AbeBooks buyers should have a reasonable expectation that they will receive the book they order on time and as described online. Sellers with high Completion standards better meet those expectations, and therefore see improved sales. In addition, by adjusting Bookseller Ratings, sellers who meet our minimum Completion requirements will be more easily identifiable to buyers. These changes also bring our standards into line with other major marketplaces and they are the first major changes to our Bookseller Ratings since they were introduced in 2007. Why was I not informed of this change? We communicated this change to all sellers via email in December 2013 and again in May 2014. In addition we have sent monthly emails to sellers impacted by the change, and have included this prominently in every monthly issue of the Bookseller Digest since December. Why have I lost a star? In addition to increasing the minimum Completion Rate we adjusted the Seller Star Rating thresholds to better reflect our new increased standards. Sellers at the lower end of a particular Star Rating's percentage range will therefore have lost a star under the new definitions. How can I improve my Completion Rate and regain a Bookseller Rating star? For additional information see How Do I Improve My Completion Rate. Can I still exclude orders from my Completion Rate? Yes, you will still have three exclusions per rolling 12 month period available to you. I am below the 90% minimum, are you going to close my account now? We never suspend or close an account without first contacting the seller. If your Completion Rate is below 90%, we will be in contact you to let you know, and help you work toward improvement. Will my star rating still default to 4 stars if I get 3 or fewer orders? Yes, this will remain the same. Your displayed rating will default to 4 stars if you receive 3 or fewer orders in a 6 month rating period and any of those orders are rejected or returned. Once you receive 4 or more orders, your star rating will reflect your actual completion rate for the orders received during the 6 month rating period. If you complete all of the orders, your rating will display as 5 stars. The only exception to this would be if you have 0 sales over 6 months, in which case you would revert back to the 4 star default. Are the types of order cancellations/returns that impact my rating still the same? Why don’t you care about the negative impact this will have on smaller sellers / Why do you only implement changes the benefit megalisters? We appreciate the challenges smaller sellers face, especially when selling on multiple marketplaces and often offline as well. However, we feel 90% is not an unreasonable completion standard for any seller, regardless of volume. And don’t forget that the minimum Completion Rate for sellers with an inventory of over 1M listings was raised to 96%, effective January, 2014 – so we actually hold high-volume listers to an even stricter standard. Are you planning any other changes to the Bookseller Rating? While no further changes are planned at this time, we are always looking for ways to improve the customer experience for both buyers and sellers. If any additional changes are decided upon, all sellers will be notified. We also welcome any feedback you might have about possible improvements to any aspect of selling with AbeBooks. If your Completion Rate is below 90%, we will contact you to let you know, and help you work toward improvement. Simply contact Customer Support for further help.